Overview: In the mid-1970s, every brand new character created managed to cross paths with Spider-Man. Either Spidey would make a cameo appearance in a new book, or the character would cross paths in the pages of Amazing Spider-Man, Spectacular Spider-Man, or right here with Marvel Team-Up. However, Marvel Team-Up allowed for more one-and-done stories and didn’t always have to work in the continuity as in the other two titles. This run of issues features a lot of familiar team-ups, such as Spider-Man partnering with the Human Torch, the Hulk, Thor, and Daredevil. But this volume starts to expand the reach of the team-ups, adding those up-and-coming stars such as Ms. Marvel, Iron Fist, and Captain Britain. There is one surprise in this collection, with Spider-Man teaming up with the all-new X-Men in Marvel Team-Up Annual #1. This came out in late 1976, during the early days of the new roster team (Storm, Wolverine, Colossus, Nightcrawler, Phoenix, Banshee, and Cyclops). While the story is written by Bill Mantlo, it was co-plotted by X-Men scribe Chris Claremont. I find it amazing that this story has not been reprinted more often, given the popularity of the X-Men during this era. If you want to read this story, your choices are owning the original issue, tracking down two issues of Marvel Tales that reprinted the annual, or getting this Essential. What makes this Essential? : This may be the best volume of the Essential Marvel Team-Up line. In particular, the run by Claremont and John Byrne in this title set a new standard for what could be done with a team-up book. Their stretch of issues (#59 to #70) were probably the best Spider-Man titles being published in that time-frame. This is a solid, ongoing narrative, with many team-ups extending over two (or more) issues. I think this Claremont/Byrne run helped establish that a team-up book could A) use the same creative team across consecutive issues, and B) that one team-up could lead into the next. This volume is definitely worth tracking down for the Claremont/Byrne issues. 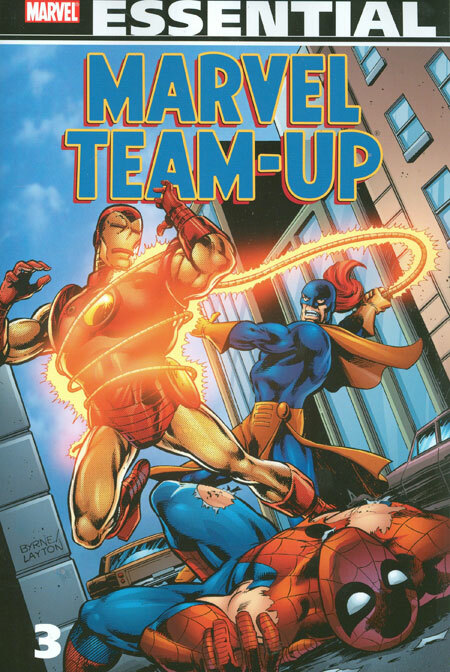 Footnotes: Marvel Team-Up #74 is not reprinted in this collection. This issue featured Spider-Man teaming up with the cast of Saturday Night Live, affectionately known as the “Not Ready For Prime Time Players,” in a battle with the Silver Samurai. While it is not included here, I did do a review of this issue for my other site, Worst. Comic. Podcast. EVER! If you like this volume, try: the Avengers Arena series from 2013 from writer Dennis Hopeless and artist Kev Walker. I know a lot of people are quick to categorize any new book or project by comparing it against a familiar item. In this instance, everyone compared Avengers Arena to The Hunger Games (or for the more literate in your friend circles, Lord of the Flies). In this story, Arcade has captured a group of young super-heroes, including x-23 and members of the Avengers Academy and the Runaways. Arcade places them on an isolated island and tells the kids that they will kill to survive, or risk being killed. From there, the story spreads out. Some characters from alliances, believing in safety in numbers. Other characters try to strike out on their own. What surprised many readers is that characters were actually killed over the course of the 18-issue series. In the end, Hank Pym and S.H.I.E.L.D. help rescue the surviving heroes, and Arcade slips away. The entire series has been collected over three trade paperbacks and are easily available. This entry was posted in Marvel Essentials, Spider-Man and tagged Hulk, Human Torch, Marvel Team-Up, Spider-Man. Bookmark the permalink.